On the fence about these still. You need really good hose clamps to make these stiffer hoses seal and the fitment wasn't always the best for me. Look great but don't know if they're worth it. Hoses are excellent quality and super thick. 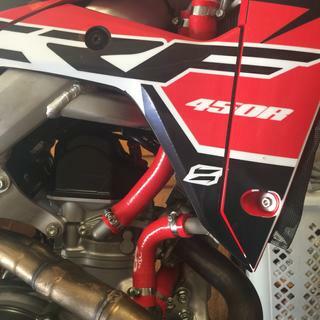 Much heavier duty than stock crf hoses. Perfect fit and Look great! The pipes fit just like the OEM, but look amazing!! Installed these on (3) of my machines. Still holding up and they look good in red. Very easy to fit to the machine and I did not have to cut the hoses they were all the proper length. I installed this on my 2006 YFZ450 in combination with the tusk in-line water cooler and it performs amazingly and looks great! Looks great and with minor trimming it works great as well. Really dresses up the cooling system. Very thick, and heavy duty. Fits well. Bought this set of CV4 radiator hoses and the build quality is nice and makes my 2012 ktm 125sx look trick but the major hose that goes into the head of the motor was cut too short and will not fit. Great product, looks great, however 04-05 TRX kickstart owners will have to cut the hose to fit, they are a little too long. I had to cut a little bit off each hose otherwise it would've kinked. Cut some off and it fit great after that. Just a heads up. I bought this hose kit 2 months ago and it has been excellent. It was very easy for me to put on, i didn't even have to remove any plastics. Since I put the hose kit on it seems like my bike runs a lot cooler. Went on with no problem and no re-fitting necessary. Have held up well for a year now with no kinking or cracking though used in the hot AZ sun. Hoses all fit perfectly to the bike. Easily installed, very durable and look great! These are good quality. Watch out for the cheap ones. These ones work well! Great fit and seems to lower temps. Bright color adds style also. I've used several brands of silicone hose kits. CV4 are the best fit and finish, and last longest. You do pay a premium for that quality though. The colors are good and the right color to match my KTM, but the inner diameter is a hair smaller than stock hoses. Overall great quality though! These CV4 hoses are awesome I've noticed my quad runs cooler and doesn't loose power due to high water temps great product! I needed to replace a hose on my KTM before riding this weekend. Figured I would go ahead and buy this kit and replace everything. First problem is this kit does not contain everything! The description neglects to mention that for KTM bikes with a thermostat, you need to be willing to put the t-stat in the trash. In my case, I have already removed the t-stat but I put in a TrailTech temp sensor in its place. The sensor uses the hoses for the t-stat housing so using the bypass hose is not an option for me. Also, the kit does not come with the hose that ties the upper radiators to the in-frame piping. The hose that HAD to be replaced was the inlet. The hose itself needed to be trimmed (not a big deal) but I had to both trim more than I should have and twist the hose as I tightened the clamps to keep it off the frame. I also looked at removing the temp sensor by using the bypass hose just to feel better about the mistake I made by purchasing this kit but the hose hits the valve cover even after trimming it. In the end what I have is a very expensive, very temporary fix. For such a highly advertised name and product CV4 has completely dissapointed me. I love how they look on my project bike. They bring a sharp look to the bike. Glad to have made this purchase. Fit without cutting and no hassle installing, performs well and looks great. 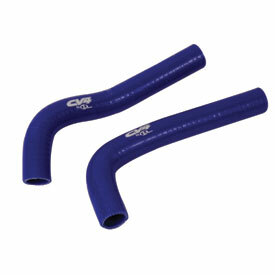 they are radiator hoses......these are probably more durable and they look cool. I kept the thermo on so I only used 2 hoses out of the 4 it came with. hose clamps are kind of low end u may want to use the stocko ones. Really happy with this product. Nothing more frustrating than a blown hose during a race. With these I have the confidence that it won't happen to me! Also use them on my son's 50sx where his pipe is very close to the hoses. They have become weakened and blown before but since the change NO ISSUES. Any time I don't have to be in the shop I can be riding. Love that. Good quality. I had to trim one of the hoses as it was too long. You may need bigger hose clamps for the top tank crossover tube. These look great once installed. these were a great fit and easy install. The blue hoses look great with my red plastic and retro blue seat cover. My oe hoses on my bike were feeling a little crunchy,so i decided to spend a little more & stepup to these silcon hoses . They fit well (i had to slice one to insert a heat sensor,they cut like butter),but i was bummed to read in the instructions they reccomend using a tappered type of hose clamps to reduce the chance of the hose getting cut by the clamp,during twisting or flexing. When i read about the hose clamps,i had the the bike completely disassembled ,so inspected the stock clamps & reused them. Spoke to a mechanic/riding friend who had these on his bike & he had reused the clamps as well with no leak issues. Over all nice quality custom fit product,but CV4 should just include the reccomended/required hose clamps. Good looking and fit well. Doesn't come with hose clamps. Here in Texas, thermostats on a dirt bike are more trouble than a necessity. the hoses let me reroute and clean it up a bit. I have a Striker with the inline hose version of the temp gauge sensor. you can buy these hoses and that Trail Tech Striker for about the same price as the Striker with the Thermostat. Plus if there is a flow benefit, I received that as well. The item description, for my particular sku, was poor. The hose quality apeared to be that of most any other silicone dress up kit but I was not happy because it didn't include the major restricted hose point on my machine & the website item description did not let me know that this was a thermostat bypass kit. TECH NOTE: PRODUCT INFO HAS BEEN UPDATED. Better hoses and looks cool. Put on in the heat of summer here in SC. Tight woods was making me overheat. Added it with the cv4 Cap and KTM fan. All in all made for a great combination. These look awesome but the price is a little crazy. It's not RMATV's fault, they're expensive no matter where you look. Look good that's it !! Bling is all it did . Didn't see any gains!!!! I am just looking for a clarification, do these hoses bypass the thermostat? BEST ANSWER: These hoses are just stock replacements made out of higher quality material. They will all have the same bends and shapes as stock. Is this a y-hose kit or just stock replacement? BEST ANSWER: it is a stock replacement kit. Hoses fit well. Also UV resistant and keep their color over time. What size hose clamps are needed for the install? BEST ANSWER: In most cases you can use the stock clamps. If you’re needing new clamps then just make sure they are about 1” in diameter before tightening. I have a kTM used the stock clamps. Is this a complete kit for a 2006 YZ250 two stroke? Or does it only have two hoses? BEST ANSWER: I order this for 07 KTM 250 sxf and it was the complete kit, minus the hose clamps. No; is 2 hoses for a suzuki ltr 450 2009. You can say is a complete kit. 15 kx450f. Will I need to trim hoses to prevent contact with header pipe? BEST ANSWER: I have not installed these hoses on your bike, however, I have used numerous CV4 hose kits on various bikes and never had to trim anything. They do a good job of sizing them for individual bikes. You have a popular bike and I'm sure if you check a few bike forums and ask the question you will learn that they fit just like the OEM hoses. They are made of a better material and flow better, they don't change their shape. I run them with an FMF Mega-Bomb header and there is no clearance problem. I'm not sure. The kit I bought was for my 2015 TC125 Husqvarna. I have an FMF pipe and there is plenty of clearance. I also have a 2015 FC450 that has the same kit and it fits perfect. The quality and fit for my application is perfect, that I can tell you. Good Luck! Would this fit in 03 yz250 with a 2015 yz250 conversion kit? Great fit and nice style. Is the diameter 7/8" ? BEST ANSWER: The inside diameter is 3/4", and the outside diameter is 1". Sorry I took so long to get back to you, I hadn't checked my mail in a while. I hope this helps! If you order it for the correct vehicle. It will fit. If it is 7/8. BEST ANSWER: Unfortunately they do not. We do offer the Mylers hose kit. does this kit only come with 2 hoses as shown or does it come with the hole entire hose kit??? This doesnt make sense???? BEST ANSWER: It comes with the appropriate amount of hoses for your particular machine.